Update your wardrobe from ground up, these trendy women's lace up platform sandals are must-haves! It checks all the espadrilles boxes for this season: Lace up, wedged, mid-heeled, platform. With all the comfort and practicality of the flat sole shoe, you'll be hard pushed to find platform sandals like this that are perfect for all occasions. We need to be a step up offering that leg-lengthening shizzle. 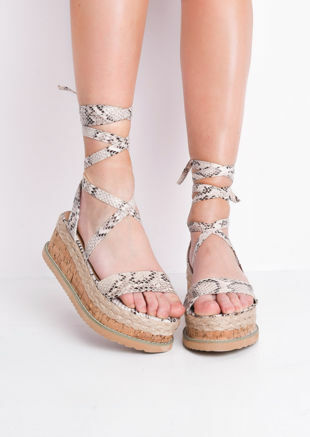 As if that wasn't enough, lace up flatform sandals espadrilles are bang on trend this season.